Berries are sweet, juicy and one of the best antioxidant sources around. They’re also incredibly versatile and can be enjoyed on their own, as a tasty yogurt topping, as a smoothie ingredient and much more. 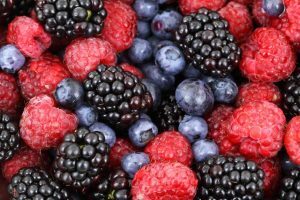 In this short guide we will be listing five of the best berry sources of antioxidants, that you should try to incorporate into your diet. Blackberries pack 62 calories per cup and have a slightly sour, tangy taste. They’re a top source of the antioxidants anthocyanins (a group of antioxidants that are found almost exclusively in berries), copper, manganese, vitamin A, vitamin C and vitamin E. Plus, they’re loaded with fiber, vitamin B9 and vitamin K.
Blueberries are sweet, juicy and contain only 88 calories per cup. In terms of antioxidant content, they contain high levels of anthocyanins, manganese and vitamin C. They’re also an excellent source of fiber and vitamin K.
Cranberries have a tart, distinctive flavor and a single cup serving provides just 51 calories. They contain large amounts of the antioxidants anthocyanins, manganese, vitamin C and vitamin E and are also rich in fiber and vitamin K.
Raspberries taste similar to blackberries but have a slightly sweeter, less tangy taste. A single cup serving supplies you with 64 calories along with plenty of the antioxidants anthocyanins, manganese and vitamin C. In addition to this, they’re a fantastic source of fiber and vitamin K.
Strawberries are one of the most popular berries available and taste great with cream. They’re a brilliant source of the antioxidants anthocyanins, manganese and vitamin C and are also the lightest berry on this list, containing just 49 calories per cup. They also contain good amounts of fiber and vitamin B9. As you can see, there are plenty of antioxidant rich berries out there. For the best results, try eating at least three servings of berries per week and you’ll supply your body with all the antioxidants it needs to fight free radicals, prevent oxidative damage and keep all your cells and vital organs healthy, functional and disease free.